Lastdollar's Frank Fairbanks 2nd Party page! Meet Frank Fairbanks. He is one of our favorite anglers. He stops in a couple of times a week and checks out our site to see how the fishing has been. He clicks on the Human Click button and we talk fishing and banter back and forth. 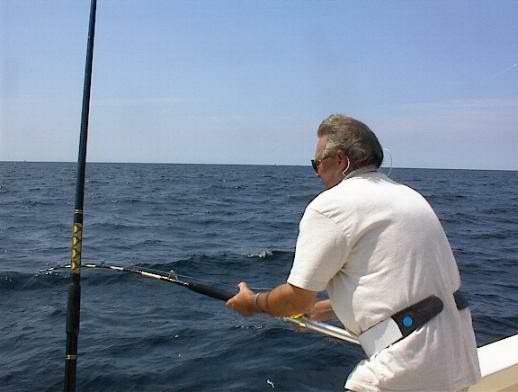 In these 2 pictures, he is fighting a nice Bluefin Tuna. I said it was a nice fish! Got that monkey off your back, huh, Frank! I've never met Frank in person, but Rick says he's a big man, about 6'4". See, I said it was a nice fish! 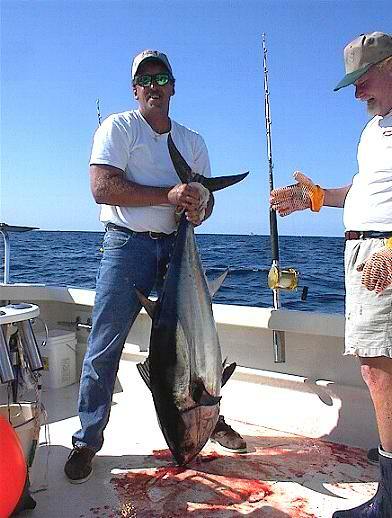 Here's Frank's friend, ED fighting another bluefin (about 50lbs). Sure glad they got the big one first, as this fish was released to see another day. That's the rules! We're glad Ed had a good time. 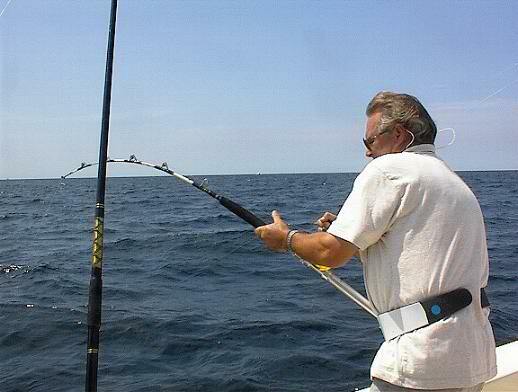 When you get those pictures back, send me one of Ed's fish, so everyone can see his first Tuna. It was a pleasure as always, Frank! THE REAL FISHERMAN IN THE FAIRBANKS FAMILY! What a cutie! LOL Takes after Teana, I see!